Azure Hybrid Benefit (AHB) lets Microsoft Software Assurance customers carry their on-premises Windows Server licenses to applications they move to Azure and easily extend their datacenter to the cloud. The AHB program, in addition to dramatic cost savings and asset productivity achieved by moving your applications to the industry’s leading hybrid enterprise public cloud, allows you to realize significant savings on licensing costs. Azure Site Recovery (ASR) is the tool of choice for our customers to migrate applications to Azure. ASR provides minimum downtime, hassle free migration to Azure across virtualization platforms and physical servers. By letting you test your applications in Azure before you migrate, and offering one click application migration through recovery plans, ASR simplifies the process of migrating to Azure. ASR supports migration of a wide range of operating systems including Windows Server and various Linux distributions, no matter what platform your applications are running on. What’s more - migration using ASR is free! Yes, you read that right the first time, migration using ASR is free. For the first 31 days from the time you start replicating your server, you only pay for the storage you consume on Azure and for the compute you use to test migration. Azure Site Recovery, now lets you leverage your Hybrid Use Benefit while migrating your Windows servers to Azure. In this blog post, I’ll show you how you can use ASR and AHB to migrate your Windows Server environments to Azure. If you are virtualized on Hyper-V, follow this article to get your servers replicating to Azure. If you are virtualized on VMware or running on Physical servers, follow this article to get started with replication. AHB is only available on servers migrated to Azure Resource Model (ARM) virtual machines. Ensure that the storage account you select for replication is an ARM Storage account and not a Classic Storage Account. Once initial replication completes, your servers reach the protected state in ASR, at which point you are ready to test and migrate your applications to Azure. Use the Compute and Network configuration on the replicated item settings blade on the Azure portal to select the Azure virtual network and virtual machine size to migrate to. PS C:\Users\bsiva> Select-AzureRmSubscription -SubscriptionName "DR Hybrid Application Scenarios"
PS C:\Users\bsiva> $vault = Get-AzureRmRecoveryServicesVault -Name "Contoso-RecoveryVault"
And that’s it! You are now all set to migrate your application to Azure. With ASR now setup to let you migrate to Azure and benefit from AHB, all that’s left to do is the final step of migrating your application to Azure. You can do this from the Portal or using ASR PowerShell cmdlets. 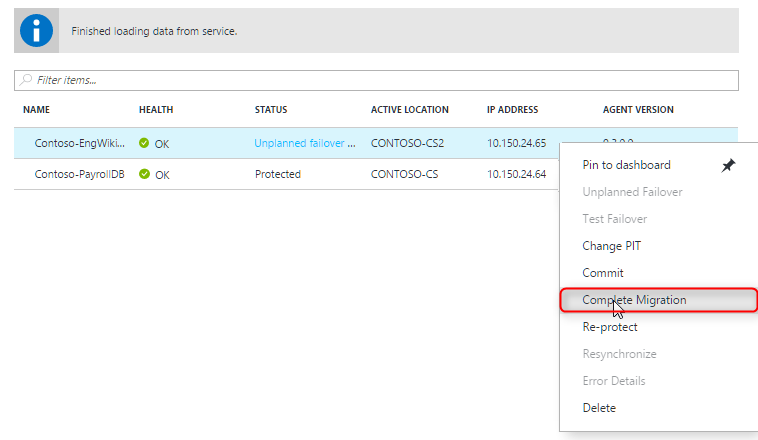 To do this from the portal, go to your Recovery Services vault, select the replicated machine or recovery plan if you’ve set one up, and select the Failover action. Once the failover job completes successfully, you’ll find your migrated VM among the virtual machines in your subscription. Verify that your VM is utilizing the licensing benefit. At this point you can clean up the replications you had setup in your Recovery services vault by selecting Complete Migration and retire the on-premises infrastructure that you were previously using to host your application. Migrating to the cloud was never easier. With a few simple steps you can easily migrate your existing applications and benefit from the superior cloud economics and power of the hyper-scale platform that Azure is. This is awesome, where do I learn more about leveraging ASR to provide business continuity for my IT infrastructure, or to migrate my applications to Azure? 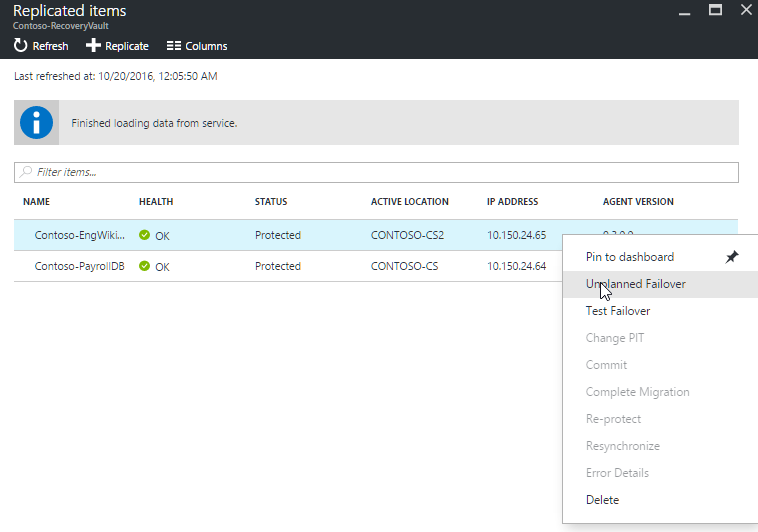 You can check out additional product information, and start replicating your workloads to Microsoft Azure using Azure Site Recovery today. You can use the powerful replication capabilities of Site Recovery for 31 days at no charge for every new physical server or virtual machine that you replicate. Visit the Azure Site Recovery forum on MSDN for additional information and to engage with other customers, or use the ASR UserVoice to let us know what features you want us to enable next.